The above info came from Valerie, and was edited by yours truly (contact me). The image came from Botch. 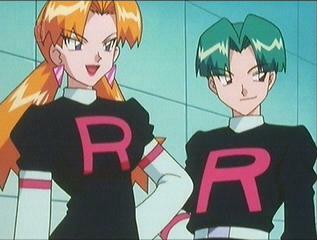 Butch is Cassidy's partner, and they both work in Team Rocket. Everyone always gets his name wrong - instead of calling him Butch, they call him Botch or Buzz. And since it's usually James that gets his name wrong, Butch in turn calls James "John" or something similar. Butch and Cassidy are considered to be much better workers than Jessie and James because they catch more Pokemon for Giovanni. It's no wonder why they are Giovanni's favorites. In fact, the Boss likes them so much that he even goes down to the police station himself and bails them out of jail.